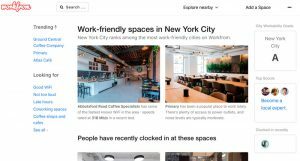 Tool Description: WorkFrom helps you to find suitable and work-friendly places wherever you are (mostly cities). You filter the places with the types of characteristics you need (i.e. public vs. private) so that you can find the most suitable place for you in the map! I think it’s a very useful tool to find places with the exact characteristics you want. Also, I find it nice that it creates a community within it so you can actually not only look at the places, but add some yourself. You can also join a Slack channel to talk with the community and get perks for time management tools for example (this last part is only available is you upgrade to Pro which is $50 per year). It’s very easy to set up an account and start searching for the ideal workplace in the city you’re staying that day. The UI is very clear so it’s easy to search and find what you really need. I think this tool works great when you’re in a big city, but when you’re in smaller towns the amount of choices you get, reduce significantly. At the same time I guess as a community member it’s important to add those places in smaller towns so people can actually find them whenever they’re there.